recent Vacation Bible School program that was conducted by South Carolina Episcopalians. The Reverend Richard C. Lindsey, Rector of All Saints Episcopal Church on Hilton Head Island, and five of his parishioners, plus a member of St. Mark’s Episcopal Church in Port Royal, have returned from conducting a week-long Vacation Bible School program in the Dominican Republic in June. 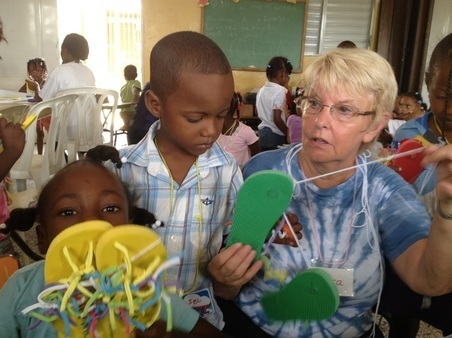 Nearly 300 Dominican children from two different churches participated in the VBS activities, which included liturgy, music, prayer, games, crafts, and liturgical drama. The sessions were held at La Redención Church located in a middle class section of Barahona, as well as at Jesús Peregrino Church located in one of the city’s poorest neighborhoods. As the team’s spiritual leader, Father Lindsey celebrated the Holy Eucharist on Sunday with Padre Alfredo Romero, the Vicar at the two churches. According to one participant, “Father Lindsey always had a ready ear and a pat on the back to share with all the adult volunteers.” Steve Tabor and Loretta Tabor of All Saints were the team’s co-leaders. Steve handled all logistical arrangements for the trip, plus a myriad of details as they were needed. Loretta developed the program schedule, curriculum, and crafts. Carole Galli was the team’s music coordinator. She began and ended each day with rousing songs. Barbara Anderson of St. Mark’s kept all the craft supplies organized and accessible at just the moment they were needed. The parishioners of All Saints donated large quantities of magic markers, scissors, glue sticks, clothes pins, paper plates, as well as countless cardboard tubes that were used in the craft projects. Pam Cooper served as the team’s translator. In addition, she played her flute during the music sessions and also managed to take numerous photos that documented the week. Susan Ferry coordinated outdoor games and activities. She made sure that everything was linked to the respective Bible verse of the day. Unfortunately, a medical situation prevented team member Kathy Jones of All Saints from going to the Dominican Republic this year. However, she led the volunteers in team-building exercises that helped to keep everyone focused on what they could each bring to the team. She also cut and packaged 5,000 fabric loops that were used to decorate 300 pairs of flip-flops!